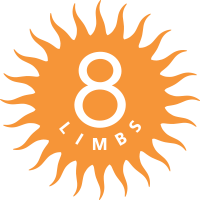 At 8 Limbs we are examining each of the 8 Limbs, one month at a time, through this Blog, in classes, and in the Many Paths Teacher Panels, 1st Sunday of each month at 6:30pm. This month our schedule is a bit disrupted due to the Superbowl (not something we usually schedule around at our yoga studio!) so our panel has been moved to Monday, February 3rd at 7:15pm at 8 Limbs Capitol Hill (replacing the 7:15pm Level II class with Anne Phyfe). Our subject this month is Pratyahara, the 5th limbs of yoga, which can be translated as sense withdrawal, or control. Join us to hear from the following teachers how they would answer the questions below, plus any questions you participants bring in. Free, bring a friend, and count it towards your 28-Day Commitment! Amy Reed is one part scientist, one part storyteller, one part mystic and one part athlete. 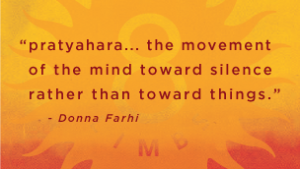 A devoted student of Yoga since 1999 and a teacher since 2004, her classes are steeped in authenticity and enthusiasm. She’s known for her clear alignment instruction, humor and accessibility. When she’s not teaching or practicing yoga she loves to cook, hike with her dogs, read & travel. Yoga, dance, music and performance have always been integrated for Douglas Ridings as arts of the body and ways of profoundly influencing one’s Rasa or internal chemistry. Douglas has a background theater, butoh, classical voice and, and, since 2005, Odissi dance. His primary teachers in Yoga have been Anne Phyfe Palmer, Melina Meza, and Kathleen Hunt. Other teachers who he have had a lasting impact on his teaching include Aadil Pakhilwala, Robert Svoboda and A.G. and Indra Mohan. His primary butoh Senseis were Joan Laage and Katsura Kan and his Odissi Guru is Dr. Ratna Roy. Douglas is an avid reader, who also plays a little bit of piano. He has been dusting off his Opera Arias with an eye toward a possible audition with The Seattle Opera chorus. Douglas also performs with experimental theater/performance art group St. Genet and with Burlesque Mavens Waxie Moon, Paula the Sweedeish Housewife and Indigo Blue. He approaches all of this varied performance work as a form of Yoga, with the ideal being a kind of Mokshya (spiriitual freedom) for both performers and audience. Lance’s practice and teaching focuses deeply on exploring the subtler aspects of yoga practice, and how we can use it to release holding patterns to create greater ease and flow in our lives. In his own yoga practice, he is interested in exploring classical practices and the texts with the goal of making them accessible and applicable in our modern world. Lance is currently studying to become a naturopathic doctor, acupuncturist, and Chinese herbalist. He is also a classical pianist, and it’s one of his biggest passions/hobbies along with cooking! When he’s not in the studio, on his mat, or studying, he loves to be outdoors. He loves to rock climb and hike, and has a pretty strong travel addiction. He wants to hear about your travels as well! 1. With the increase in technology (and technology compulsiveness), many people find it difficult to simply pause for a moment with nothing in particular to do, let alone go for total sensory withdrawal. What are some simple things from a yogic perspective people can do, or consider, to tame intense cravings for stimulus? 2. Judith Lasater said “I like to think that for Pantajali pratyahara meant something different than a simple withdrawal from life. To me pratayara means that even as I participate in the task at hand, I have space between the world around me and my responses to that world.” Can you give a specific example of a “task at hand” in which your pratyahara practice comes to life? 3. Yoga writer Fergus Higgens wrote, “After we have withdrawn our senses, what is left? The sum total of everything you have experienced in your life…hello there, self!” How do you personally prepare to meet your “Self”? Come hear how these amazing yogis answer these questions and yours tonight at 7:15pm.